What the hell are canelés? They’re not as fetishized as macarons, as common as croissants, or as dunkable as madeleines. But they do hail from France (the Bordeaux region, specifically). And they are worth introducing to your taste buds. Canelés are basically baked custards that looked like they popped out of a tiny 70s jello mold. When I emailed Smack about leaving the box at my front door, they were concerned about the canelés losing their crunch if exposed to the whims of the weather. This company is definitely a labor of love. Not just because of their concern with the quality, but also the presentation. The caneles come immaculately packaged in a gift box with a giant bow. BTW, they were spot on about the importance of the crunch. That’s what made these little babies so good. They were just sweet enough, fragrant with vanilla and rum. The dark chocolate ones were the best. Tip: after refrigeration they lose their crunch around day 3, so order only what you can eat while fresh. This is something that doesn’t show up on dessert menus much in the U.S., so when I do see it, I order it. Floating island is a French dessert, a ball of meringue (the “island”) floating on creme anglaise (custard). Side note: the English like pouring custard or cream over many of their desserts, a practice that I wish were more widespread. This recipe is a creative take on the traditional floating island from pastry chef Anthony Chavez of 2941 via Washingtonian magazine. When I’ve made meringue for pavlovas–meringue nests filled with cream and fruit–they’ve always deflated pretty quickly. After listening to NPR’s “The Splendid Table,” I learned that fats are the enemy of meringues, so be sure to use a metal bowl when whipping the egg whites. Plastic bowls tend to absorb more fats. Peel and remove the pith from the mandarin oranges, then cut them into segments. Set aside. In a medium bowl, combine the mandarin-orange juice, Champagne, vanilla, and 1 tablespoon of sugar. Chill in the refrigerator. In a mixing bowl, combine the egg whites and 2 tablespoons of sugar and whip until the mixture forms stiff peaks. Pipe it into dome-shaped flexible molds. Place the meringues into the oven and bake for 1 minute or until firm. Remove from the oven and cool. Pop the popcorn in the microwave and set in a large, heatproof bowl. In a large pot set over low heat, caramelize the 2 cups of sugar. Add the butter and whisk until combined. Pour the caramel over the popcorn and stir until well combined. Turn the caramel-coated popcorn onto a sheet pan and let cool. When the popcorn is cool, chop it into small pieces. Unmold the baked meringues and sprinkle the popcorn on top of each meringue. Place each meringue in a bowl and garnish with the mandarin segments and mandarin jus. It’s official. French macaroons are the next cupcake. Or are they? I know of just a handful of shops that sell macaroons exclusively. They’re hard to make and keep crispy–texture is big, since you want the cookie part to have the effect of a meringue. Plus, their price (starting at $1 when you buy them individually, for a cookie barely larger than a quarter) makes $3 cupcakes look like a value. Photo Source: Notes from My Food Diary. Click photo to view. 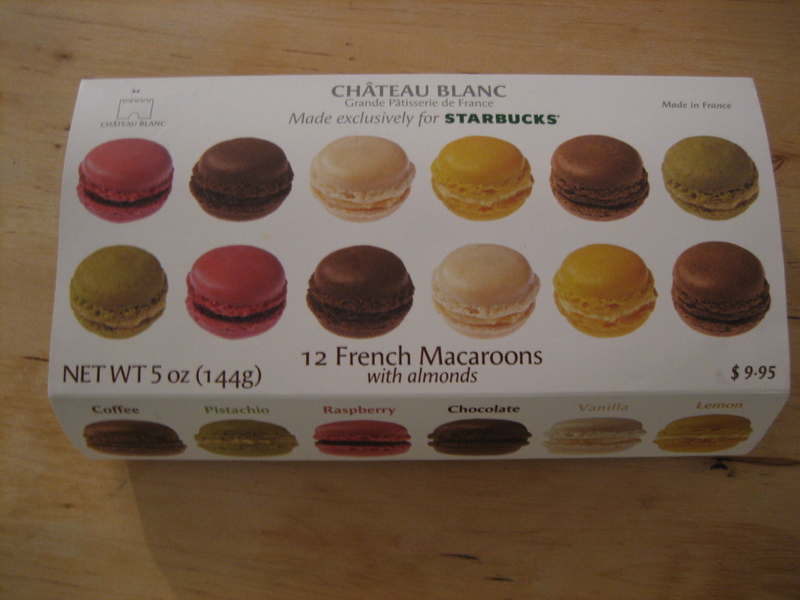 But I was disappointed by these from Starbucks, made by Chateau Blanc. Macaroons are supposed to be crispy on the outside. These are soggy, probably due to being transported from France, then languishing too long in the refrigerated case next to the tuna paninis. Texture-wise, they have a nice heft and chewiness to them, if you can overlook the lack of crunch. With the exception of the raspberry, jam-filled macaroon (my favorite), the other fillings were mostly cream-based and somewhat lacking in flavor. They’re $9.99/dozen, limited edition through the holidays. That’s what the advertising says, anyway. But at twice the price of the Trader Joe’s macaroons, might as well go for the Trader Joe’s. (Unless you like fruity macaroons. TJ’s only offers chocolate and vanilla. Read about ’em here: http://bit.ly/8SkInT). Croquembouche. Crisp in the mouth, delicious in the stomach. Whatever you might say about the French (don’t get my dad started), there’s no denying that they know how to live. Take this traditional dessert, croquembouche, which translates to “crisp in the mouth.” It’s basically a tower of cream puffs in a web of spun sugar. You crack the sugar with the back of the knife before serving it to your awestruck friends. Food Network Magazine featured a recipe for making this from scratch in their December issue. They preface the recipe by saying it’s easier than it looks, which usually means it’s not. Sure enough, the recipe goes on for three pages and involves a pastry bag–already too complex for me. Rather than trying to make cream puffs, you could buy some in the freezer case and do the spun sugar caramel yourself. I’ve included that part of the recipe below. Directions: Mix the sugar, corn syrup and 1 cup water in a saucepan. Cover and bring to a boil over high heat. Don’t stir. Uncover and boil, swirling the pan, until the syrup turns deep amber, 20 minutes. Immediately dip the bottom of the pan into a bowl of ice water for a few seconds to stop the cooking. Transfer the caramel to a liquid measuring cup and cool just slightly–it should still be hot and liquid. Draw a seven-inch circle on a parchment-paper lined baking sheet. Partially dip each puff in the caramel, letting the excess drip off. Arrange the puffs around the circle. (Note: If the caramel hardens, microwave about 45 seconds.) Build the base of puffs, continuing to stack into a tower formation of smaller circles. To get the “web effect” of spun sugar, dip the tip of a fork into the caramel and quickly wave it in circle around the tower to create a web of caramel strands. Repeat. (Make sure your working surface is covered in parchment paper, because this process can be messy.) Let set. Destroy web before eating. Voila! One of the reasons I love this time of year is Trader Joe’s holiday products. There’s always an impressive selection of cookies, cakes and chocolates. I’m not sure whether these macaroons will be a holiday-only dessert, but I sincerely hope not. They’re definitely in the running as a freezer staple. When I read about these in the holiday flyer, I was initially disappointed there were only two flavors (vanilla + vanilla cream filling and chocolate + chocolate ganache filling). Now that I’ve tasted them, I’m even more sad about the limited flavors. They’re good enough to deserve a product extension. 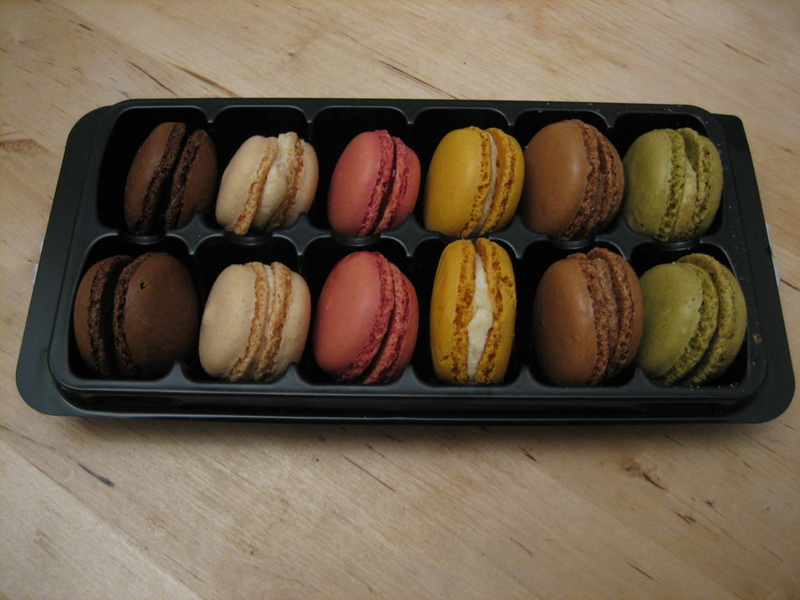 First, this box of a dozen is a pretty decent value, at $4.99/dozen (macaroons are usually at least $1 each at patisseries). Second, they’re just as tasty as what you’d buy at the patisserie, if not better. Even though I was initially worried that they’d lose their crisipiness in the defrosting process, you’d never know they came from the freezer. The cookie portion of the sandwich is crunchy on the outside, chewy on the inside (it’s a combination of egg whites and ground almonds, so it eats like a meringue). The real clincher was the filling. The vanilla cream is lightly sweet and fragrant; the chocolate ganache, the perfect balance of bitter and sweet. (Try the chocolate macaroon before it’s completely defrosted if you prefer a chewy center.) I was so impressed that even I texted a girlfriend, a fellow macaroon fiend, to stock up on these before other Trader Joe’s cutomers get their hands on them.